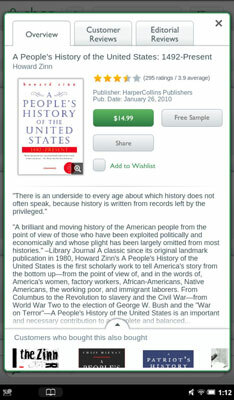 Purchasing books and periodicals for your NOOK Tablet gives you access to their content. Although loaning among friends is allowed and libraries are expanding their abilities to lend digital copies of books, the B&N store still has the easiest access to the largest variety of books, magazines, and newspapers. Sometimes you can see a sample from the book — an entire chapter or a hop, skip, and jump through the pages. Tap the Share button to tell people what you’ve found. (Perhaps you’d like to drop a hint about the perfect birthday gift for you?) You can rate and review your thoughts about the title, posting them to Facebook or Twitter. Tap the green button that shows the price. The button will change its label to Confirm. The new item appears on the left of the Daily Shelf and in your Library. And it wears a New badge until you open it. If you’re asking to download a copy of a free book at the Barnes & Noble store, you still go through the “purchase” process; the cost will register as $0. If you pre-order an eBook, you’re charged when it’s officially published. You can buy individual issues of a newspaper or magazine, or subscribe to daily, weekly, or monthly delivery of the periodical. Just as in the world of paper and ink, the best deals come with longer-term subscriptions. Once you buy, the first issue downloads immediately. 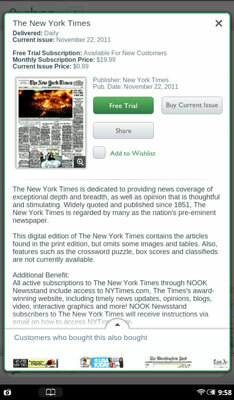 Nearly every magazine and newspaper offers free 14-day trials; you can get one free trial for each publication. If you cancel the subscription before the end of the trial, your credit card isn’t charged. Otherwise, deliveries continue and your credit card is charged automatically at the monthly subscription rate. 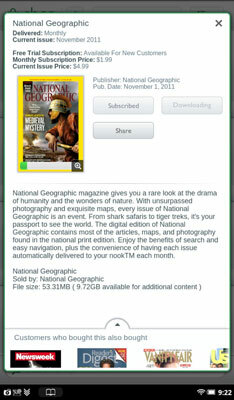 To cancel a periodical subscription, go to your account at BN.com, log in, and go to the Manage Subscriptions section. A small green bar shows how far along a magazine download has gotten. This issue is completely downloaded. Tap the cover and open the Details page. Tap the Buy Current Issue button. The subscription process begins with a free trial; if you don’t cancel before the end of the trial, you are automatically subscribed. Tap the Free Trial button. Tap the Start My Free Trial button. You can always return to the Shop page by tapping the Shop icon in the upper-left corner of the screen.